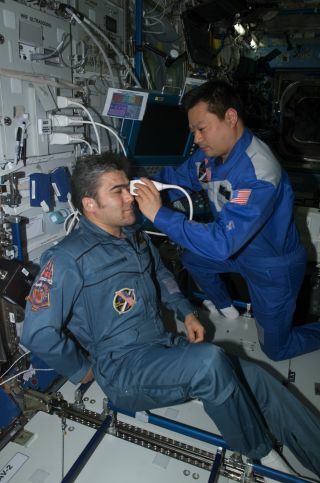 Astronaut Leroy Chiao performs an ultrasound examination of the eye on cosmonaut Salizhan Sharipov aboard the International Space Station. NASA helped turn the station's ultrasound machine into an all-purpose diagnostic imager with a direct line to doctors on Earth. The technology could help diagnose sick people in isolated communities around the world. The revolution is alive and well in the real world, thanks to the efforts of designers and programmers. They not only seek to make the theoretical practical but also see that abstract discoveries are applicable to solving challenges for millions of people worldwide. They understand that the applications we use are the very reason we own these handheld devices in the first place. They know what everyone should know and appreciate: that we cannot revolutionize our world if we do not encourage others to explore the many worlds (and wonders) of space. This rule also governs positive changes in health care. I write these words from experience, given my involvement with an app like MediCode, which makes it easy for physicians, paramedics and nurses to save lives. The algorithm responsible for this tool is proof of the power of science, technology, engineering and mathematics. It confirms that how we communicate is, in large part, a product of space-based communications systems — that what astronauts do in the heavens relates to what first responders do on the ground. To readers, I say: Let us ensure the longevity of the space program by making sure we do a better job of educating the public about the value of the products and services we value most, many of which would not exist without NASA and those bold enough to explore space. Let us invest in knowledge, period, so we do not have to repeatedly defend what should be obvious to all: that we must give space to space, so to speak. We must provide the means for scientists, researchers and astronauts to launch and manage missions to space. The lives we save from an app apply directly to the lifeblood of the space program. The two are inseparable, as they should be, because what happens in space leads to advances here on Earth. From their worth as issues of pure science to their potential to improve medical science, the Space Age is the precursor to a new age of health care. The evidence of that assertion rests with your ability to tap, touch or swipe the screen of the device at your disposal.